I am currently breastfeeding my fourth baby who is now two months old. I have breastfed all four of my babies but I had never tried a breastfeeding cover until now. With my first baby, I was so anxious to breastfeed in public. I remember covering up with scarves or blankets when I was out and about and needed to feed my baby. A scarf is reasonable but I imagine my daughter would not have been too happy about be covered with a hot, stuffy blanket! My second and third child were not subjected to the blanket-cover treatment. I discovered the one up one down method of wearing two tops and pulling one up and the other down in an effort to preserve my modesty as much as possible. This method works very well but one thing I could not do comfortably, was wear a top I could only pull down and not up as this would expose my breast. Then I was sent a breastfeeding cover from Infinite Mommy. Infinite Mommy came about because of one mum's experience of breastfeeding her baby. Dee discovered that breastfeeding in public requires a lot of confidence and only 57% of mums had this confidence. She wanted to change that so she designed a luxury, organic cotton, breastfeeding modesty cover that would allow mums to feel both confident and stylish while breastfeeding their babies in public. The Infinite Mommy breastfeeding cover comes in a range of colours and some styles have printed designs on them. 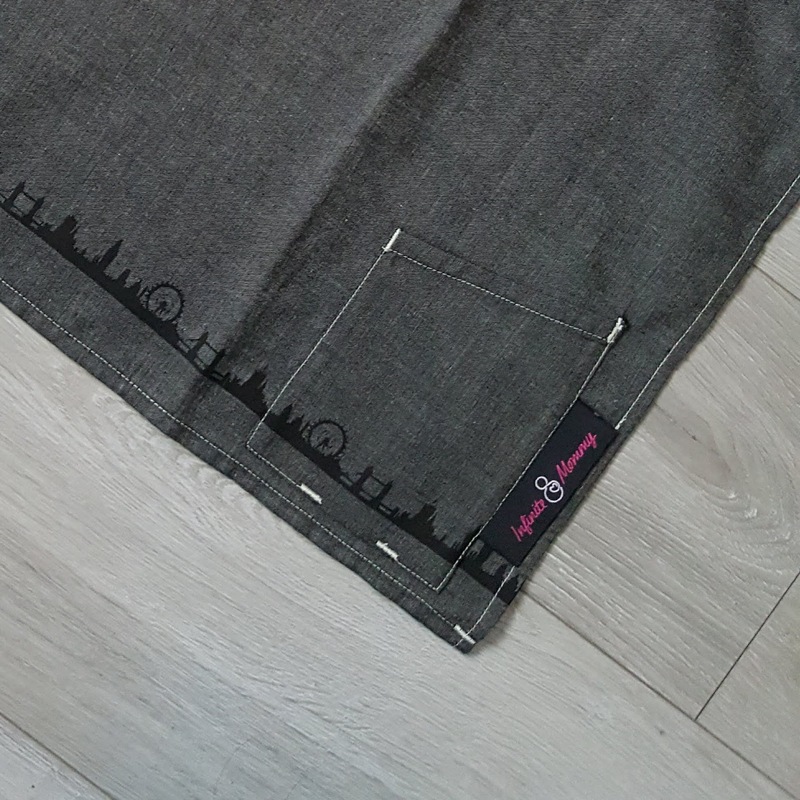 The one I was sent is black and has an attractive print of the London Skyline running along the bottom edge. I really love this print. It is quite subtle as it only runs along the bottom edge but I think this makes it seem even more sophisticated and luxurious. The fabric is 100% Fairtrade organic cotton which is very lightweight and breathable, unlike the blankets I used previously! The strap is made from organic goatskin leather and can be adjusted by using the brass studs. There are also pockets on either side of the cover which can be handy for storing things. The cover comes with a handy drawstring bag so you can carry it around easily when you are out and about. 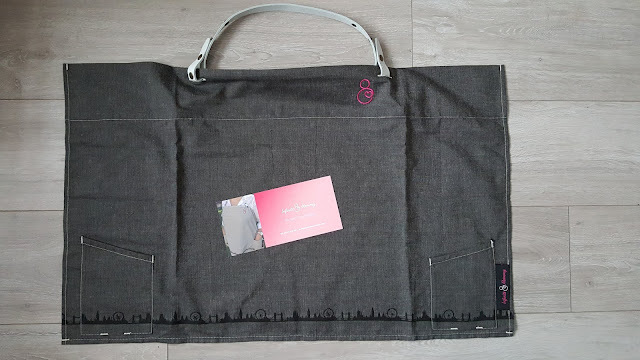 Since receiving this breastfeeding cover, my breastfeeding experience has been revolutionised! Not only does it make breastfeeding so comfortable and easy, it means I can wear tops and dresses that I can pull down instead of up. This has meant that I can wear many more of the clothes in my wardrobe. Moreover, it gives me that extra peace of mind that I am preserving my modesty no matter what I am wearing. 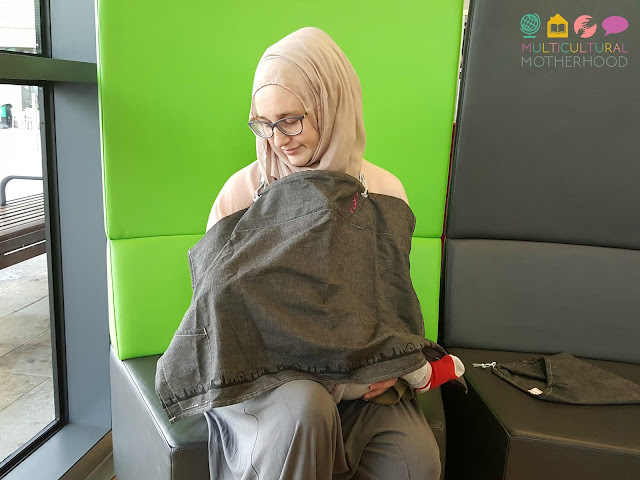 If you are anxious about breastfeeding your baby in public, why not try a breastfeeding cover and see how easy breastfeeding can be. 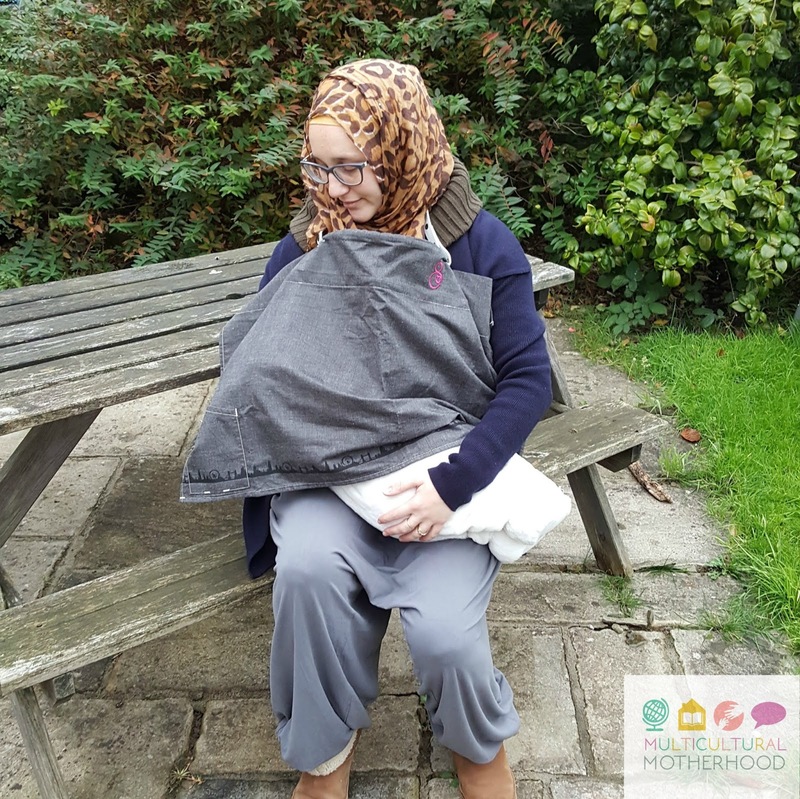 Infinite Mommy are offering readers a 10% discount on the purchase of their breastfeeding covers using the code MOTHERHOOD. Simply go to the Infinite Mommy website and enter the code at the checkout. Offer valid until January 13th 2018. 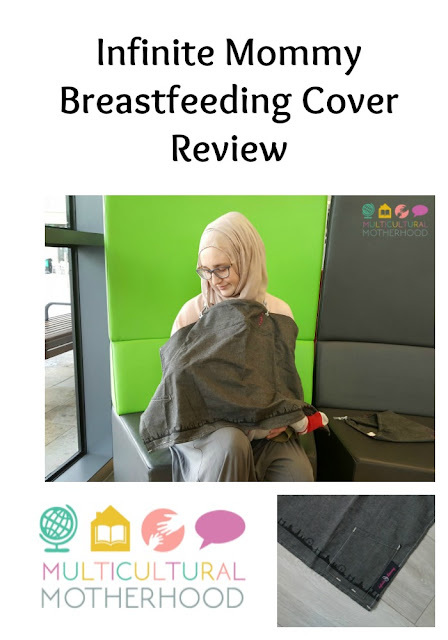 Disclosure: I was sent a breastfeeding cover for the purpose of review. All thoughts and opinions are my own.